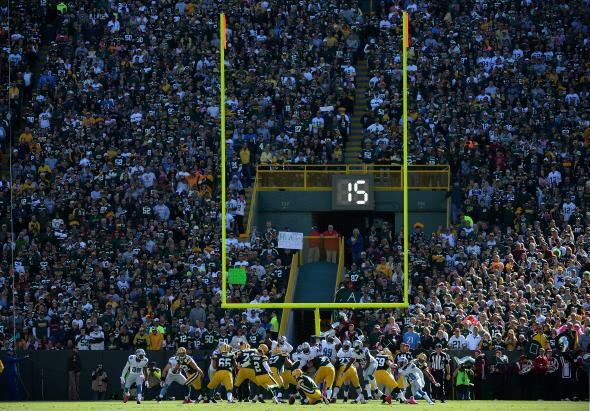 NFL owners vote to move extra point back to 15-yard line. The sweetest sight in football. NFL owners voted on Tuesday to change the league’s extra point rules for the 2015 season, moving the placement of the ball for a potential extra point kick back from the two-yard line to the 15-yard line. A rule change had been bandied about—including consideration given to eliminating the extra point altogether—because, basically, the extra point kick had become so utterly automatic it had become a pointless ceremonial exercise. After the 2013 season, Roger Goodell estimated there were only five missed extra points all year—across the entire league. The owners, however, voted to go in the opposite direction by making extra point attempts just a smidge more challenging. Two-point conversions will still be snapped from the two-yard line, but the defense will now be able to return a blocked kick for two points. Snapping the ball from the 15-yard line should still be a pretty easy shot for NFL kickers—and a 32-yard kick certainly isn’t hard enough you’d expect teams to start going for two every time (but perhaps every once in a while). It will, however, add just enough uncertainty to keep you in your seat and put more emphasis on the kicking game, which, after all, is why fans go to the stadium on Sunday—to see their favorite kicker until he gets waived.